The first impression on taking the Black Pearl out of it’s kite sleeve is that this is a solid, well built kite from Level One. All the fine touches are evident: snag-free nose, locking larks-head knots on the upper and lower bridle attachment points, a nice, thick wear patch for the upper spreader, and an extra layer of reinforcement on the trailing edge where the standoffs attach to the sail. This last detail is the first glimpse we get that the Black Pearl is a very pitch-happy freestyle kite. Speaking of the standoffs, as was mentioned in the Black Pearl UL review, the standoffs come together in a somewhat unique arrangement, starting 7.5cm apart on the sail, but converging right together on the lower spreader. I’m not a kite builder myself, so I can’t speak to the positive or negative effects of putting the standoff cups together on the lower spreader; as an end user, I did find that it makes disassembling the kite a little harder, the fit between the cup & the rubber tip on the standoff is very tight, especially when the rubber is brand new. The Black Pearl is an impressive mix of SkyShark (3PT, P300 and Black Diamond Nitro) and Matrix CFK rods; strong without being overly stiff. 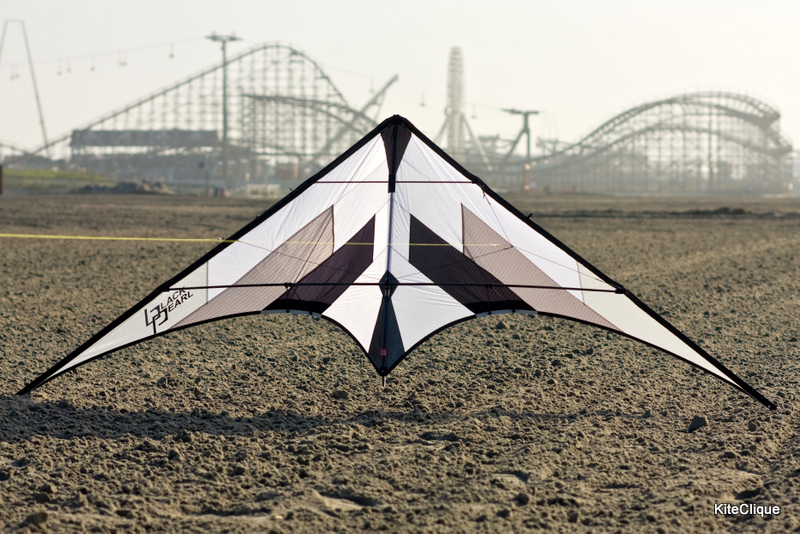 One note, the kite I was flying had a SkyShark P300 spine in place of the SkyShark P3X indicated on the website. I’m not certain if that change was necessitated by the recent troubles in sourcing P3X rods or if this was just an oversight. The sail has a very striking angular design, there’s not a curve to be seen anywhere on the layout. The demo kite I flew was done in a monochrome layout, which inspired very bipolar reactions; some who saw it loved it for it’s simplicity, others felt that it needed a splash of color to better stand out in the sky. Level One does offer this kite in either Orange or Blue as stock colors, and a colorized version is available for a premium price. 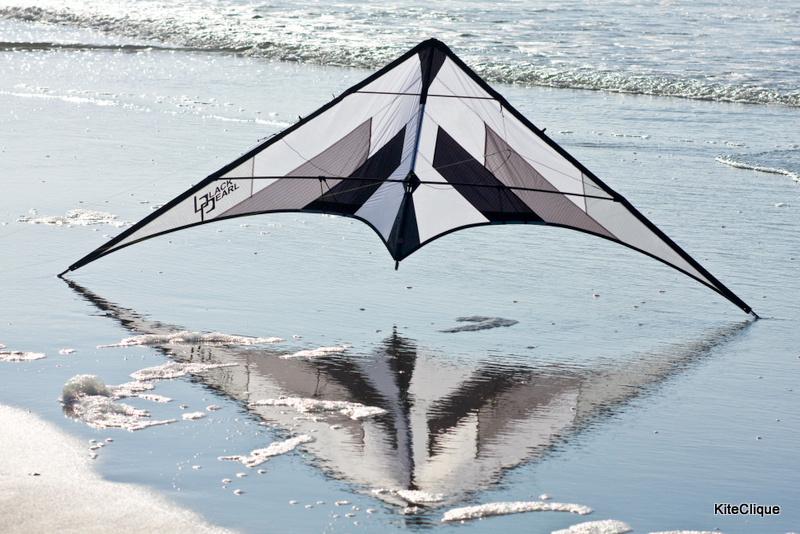 The Black Pearl is surprisingly nimble and agile for a kite with an 8 foot (2.4 meter) wingspan. To be honest, my first impressions in flight were that it was a smaller kite, because it has a similar feel to other .85 size kites I’ve flown. 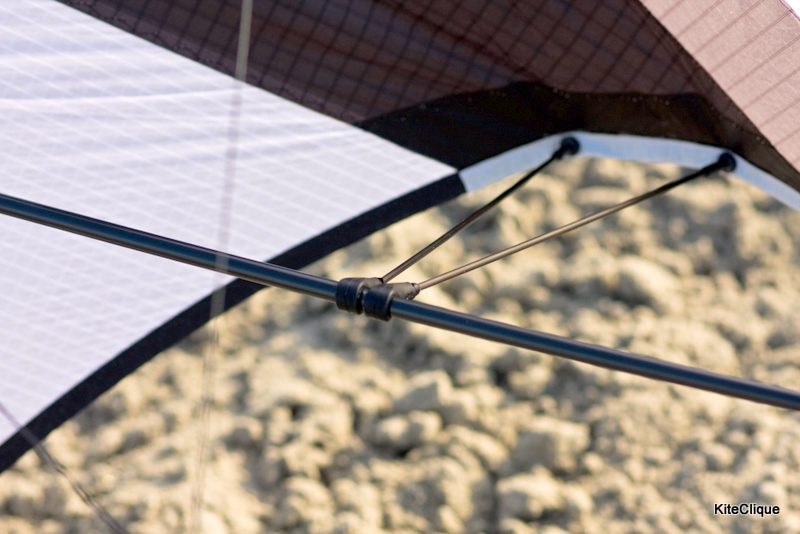 For a standard kite, it has a very versatile wind range, I’ve personally flown it in winds as low as 3-4mph, where it feels very floaty and soft, but still performs well, and as high as 20mph, with gusts pushing closer to 25mph. Granted, there’s not much tricking to be done at those higher speeds, but the feel was still balanced, and I didn’t find that I was being pulled around by the kite, which again came as a surprise considering the wingspan and size. My own flying style is a mix of precision & freestyle, as a sport kite competitor one of my primary considerations when evaluating a kite is how well those two are balanced, particularly for use in ballet competition. The Black Pearl did not disappoint, and while it would be well suited to a freestyle, tricks party or hot tricks style competition, it can still hold a nice straight line across any part of the wind window, gives nice, square corners, and can stall pretty much any place in the air I chose to stall it. I’m not sure that I’d use it to fly precision figures in competition, because overall it’s speed is a bit faster than what I’d prefer, but I’d use it for choreographed flight without a second’s hesitation. In freestyle tricking, the Black Pearl really shines. This kite loves to trick, and loves to make the pilot look good while tricking. There were a number of tricks I still struggle with on other kites which came very easily on the Black Pearl. I found that I could perform a nice series of cometes, particularly in lower winds. Basically, any pitch based trick is right at home on this kite. I was consistently rolling up and unrolling this kite, and I was especially enjoying rolling the kite up, then pulling a half axel, following into an unroll. Ceiling to floor cascades are very straightforward on this kite, even allowing for a little bit of sloppiness in the timing without the kite going all out of whack. The wide wingspan meant that I could perform some very nice side slides, bringing the kite all the way across the wind window, then axel down into a tip-stab landing. Stringing tricks together on the Black Pearl was incredibly easy. I could probably stand in one spot and Jacob’s Ladder continuously for the better part of the afternoon. Flic-flacs were smooth and could be done with a minimum of body movement. The kite was equally easy to roll up either from a barrel roll or an over-rotated flic-flac. Backspins were also a tremendous amount of fun, leading to more than one time when I would put too many twists in my line simply because I didn’t want to stop the spinning motion. There are a few areas that I might suggest for improvement though, and it almost all comes down to snags. The harder you push the Black Pearl, the more likely you are to encounter a line snag. This wasn’t as evident at the beach, where the winds were smooth and even the whole time I was flying, but once I brought the kite inland and had to deal with variable wind speed and direction, I found that I was spending a lot of time untangling the line from one of two places: the yo-yo stoppers and the tail. The yo-yo stoppers are “over the leading edge” style clips, zip-tied into place, which means that there’s plenty of gap around the top of each one, and it’s easy (perhaps too easy) to get the flying line wedged under the clip, with no recourse but to walk out to the kite and manually untangle it. I’m not certain if adding thicker leaders to the bridle would help to mitigate this, or if a different yo-yo stopper needs to be investigated. I suppose I’ve been spoiled by the likes of the Saber, Hydra and Jinx, which all integrate the yo-yo stopper into the leading edge dacron, and don’t present any snag points. So, when flying in less than ideal conditions, the Black Pearl will make you conscious of your slack line handling. The other thing I noticed was that due to the amount of time the kite spends rolled up, and the relatively thin line used for the bridle, there seems to be a large amount of wear on the Nitro lower spreaders. Secondly, Will Sturdy took it out to fly between events at a competition in Richmond, VA. While I don’t have a direct quote from Will, his impression was also that the Black Pearl was fun to fly, but moreso as a kite to take out for pleasure instead of competition. Will’s concern was that the kite was too quick to roll up, and seemed to be balanced a bit to far to support pitch tricks, at the expense of a more well-rounded flying experience. What does it all add up to? Well, I’d take the Black Pearl out when I just wanted to have a good time, to fly and to look good for my spectators. This is just the sort of kite I love to fly at the beach in the summer, when I’m not looking to fine-tune my inputs or focus intently on competitive maneuvers. The Black Pearl is just fun to fly.